Datil pepper – unique to St Augustine Florida – is a key chile pepper in some of our favorite hot sauces. Usually sweet, and paired with sweet ingredients, the result is a spicy sweet hot sauce that is unlike any other. We do love the Datil pepper here at HotSauceDaily. 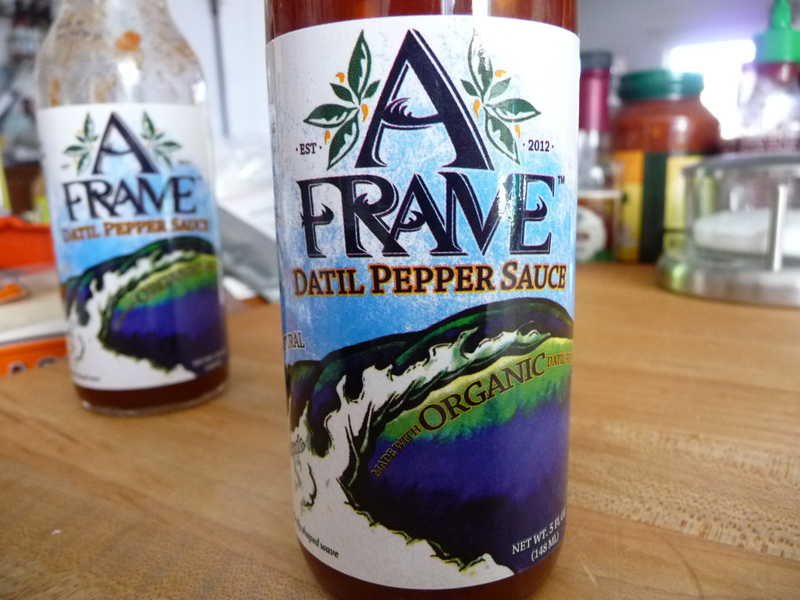 This time it’s the A Frame Datil Pepper Sauce that gets our attention. The label proclaims “all natural” and “organic Datil peppers” along with an artistic vision of what exactly an “A Frame” really is – a surfer’s description of the perfectly shaped wave. In fact, A Frame Datil Pepper Sauce is indeed the creation of a group of surfer friends from Florida that were in search of the “perfectly shaped sauce”. Growing their own Datil peppers organically, Scott Herlihy and his crew at AFrameSauce.com have bottled a sweet Datil Pepper sauce that is both chunky in appearance and sweet in taste. Ingredients: brown sugar, diced tomatoes, ketchup (tomato concentrate, high fructose corn syrup, distilled vinegar, corn syrup, salt, onion powder, garlic powder, natural flavors), sugar, yellow bell pepper, red bell pepper, apple cider vinegar, onions, water, green chile peppers, Datil peppers, lime juice, salt, dry mustard. Texture & Appearance: – With a beautiful cling to the sides of the bottle, this sauce pours thickly. It’s slightly clumpy, yet in a pourable thinner sauce base. I love the texture as there are tons of chewable bits to enjoy with it. Taste Straight Up: – First up, the big taste is sweet. It’s very sweet. Did I mention sweet? Ok, almost overkill on the sweet. Straight up, the heat comes on quickly but is short lived. I’m disappointed that the Datil pepper heat is so “hidden” in this sauce. The Datil pepper is actually 4th from the END of the list of ingredients, and the taste supports this. Just not enough Datil in this Datil Pepper sauce for me. Heat Level: – The heat straight up is strong, albiet only a 1 1/2 – but when poured onto tacos and pizza (more on that later), the heat gets lost, and I’d have to put it at a 1 – yes, a 1. Sweet with little heat. Label/Graphics: – Love the graphics on the label – the aforementioned wave is artistically drawn and the fonts and lettering are spot on. I would purchase this sauce, as seen on a shelf in a store, based solely on the lettering and the fact that it is a Datil sauce. No complaints here. Overall Rating (Taste on Food, Final Thoughts): – I first tried this sauce on pizza… just meh. I would not put a sweet pepper jelly sauce on a slice of pizza. Fail #1. The next big test was on our homemade tacos. I was disappointed to find that the sauce got lost in the spicy taco meat. All I got from it was sugary sweetness. The Datil heat just did not come through. Fail #2. Ok, no problem because I really wanted to like this sauce and find the perfect food or snack for it. 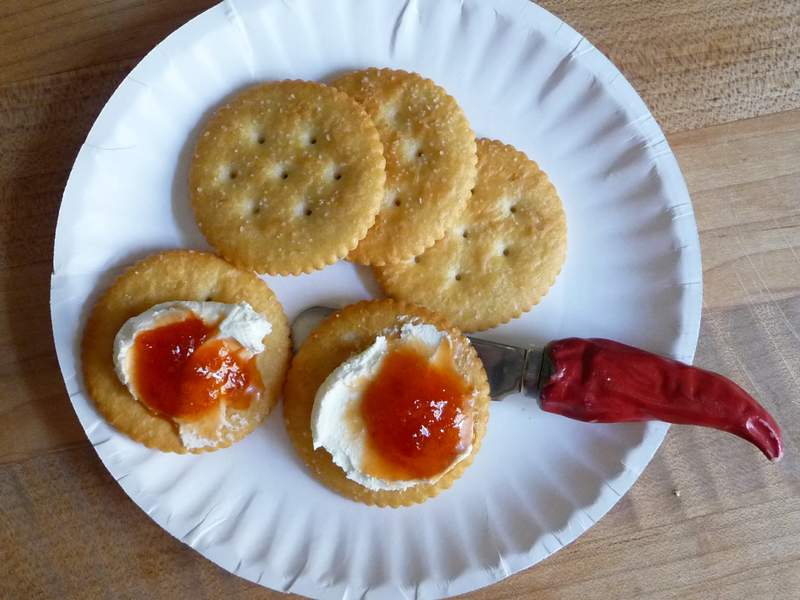 So the next taste test was on Ritz Crackers with a dollop of cream cheese with the A Frame poured on top. Bingo! Guess what? 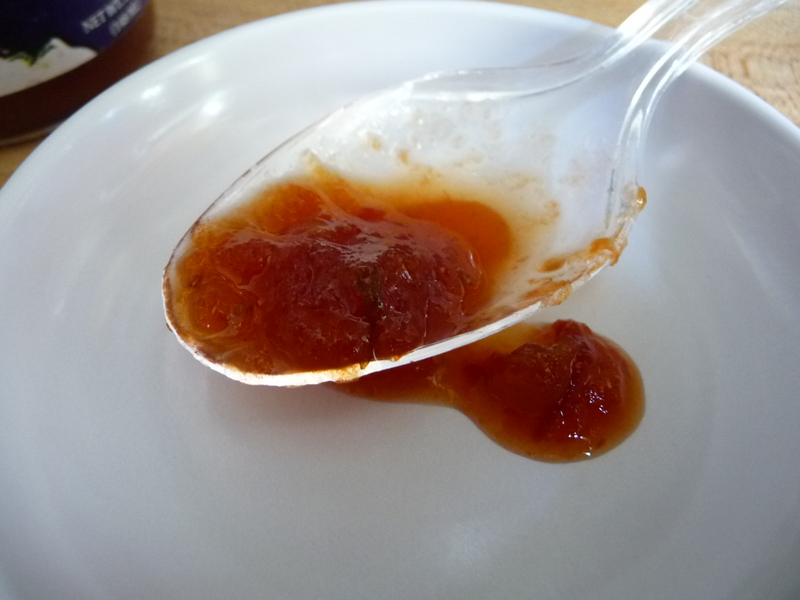 We just discovered what this sauce really is… a pourable version of a good pepper jelly. Yup. It has all the qualities of a pepper jelly – that being peppers and sweetness. It’s just not a jelly, but a sauce that pours and tastes like a pepper jelly. Bottom Line: It’s a pepper jelly, made with Datil Peppers, that you can pour from a bottle. This sauce disappointed in it’s heat level and strength. It truly is delicious, but all said and done it pales in comparison to other Datil sauces on the market. The A Frame boys need to kick this stuff up a notch or two – or three. This is a delicious sauce, but definitely very sweet. So glad you experimented til you found the cracker/cream cheese combo. My next taste test is going to be on fried shrimp… I have a feeling it’s gonna rock on those! Fried anything and it’s golden! Thanks Marilyn. Too bad they use Ketchup instead of going from scratch. They could then avoid the corn syrup. Sounds like it would be good on red pepper jelly pork chops though. I don’t think I know them but I am sure that I surfed the same breaks as them (writing on the road, Vilano, Blowhole, Flagler, etc). “forehead slap” – Pork chops or tenderloin… that would be a great meat to pour this on. Double forehead slap, Brian! You will not be dissapointed, might I also add that it’s to die for on fish tacos! 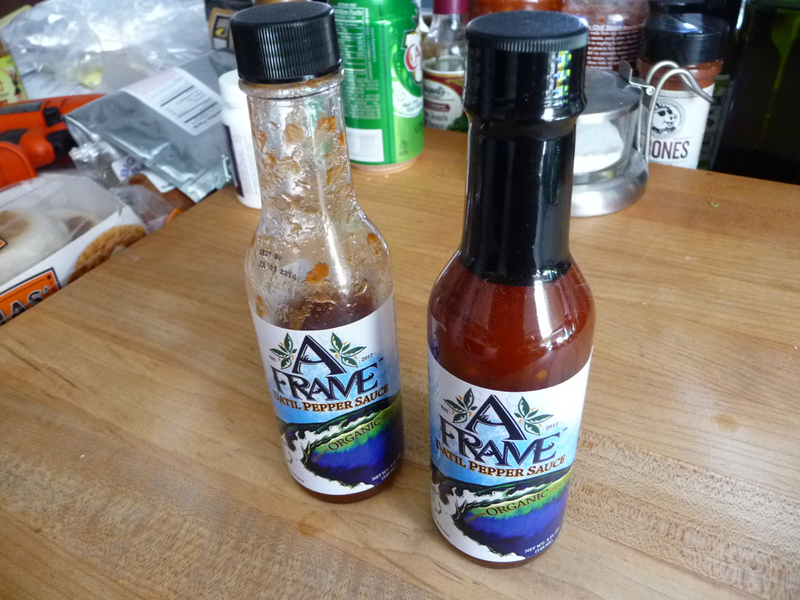 a frame hot sauce is the best datil pepper sauce available…I highly recommend it!